A school management system is nothing without solid, reliable support and we're obsessed with understanding how we can improve MySchool and the service we provide. We know we can't do this without constant feedback, advice and criticism from the users of MySchool, so we've made it very easy for everyone who uses our system to let us know exactly what they are thinking. It's not guess work. We measure satisfaction and invite feedback using industry standard customer satisfaction measurement methodologies. Every single interaction our support team has with our customers can be rated, allowing us to react immediately if we're not hitting the mark. You can see our live satisfaction score here. We regularly invite our customers to tell us how we're doing, using the industry standard Net Promoter Score model, used by many well recognised brands and academic institutions. 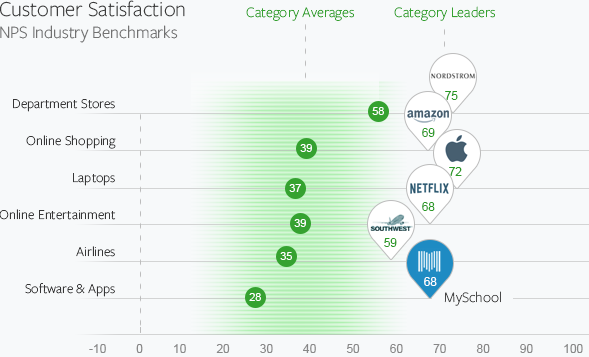 We're proud to share an NPS rating of 68, similar to well known brands like Amazon, Netflix and Apple. "Customer service and the recent updates and dedication to ongoing improvements and customer involvement."